Modified atmosphere packaging is a technology used to preserve the quality of fresh produce so that it can be sold to markets far away from where it is grown, extend the marketing period, and help reduce food waste within the cold chain. The gas composition used to pack food products depends on the product. A high oxygen content helps to retain the red colour of meat, while low oxygen reduces mould growth in bread and vegetables. The gravimetric method uses sensitive and accurately calibrated scales to weigh the amounts of gases added into the cylinder. Precise measurement is required as inaccuracy or impurities can result in incorrect calibration. The container for calibration gas must be as close to perfectly clean as practicable. The cylinders may be cleaned by purging with high purity nitrogen, the vacuumed. 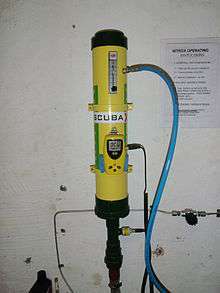 For particularly critical mixtures the cylinder may be heated while being vacuumed to facilitate removal of any impurities adhering to the walls. ↑ Bevan, John, ed. (2005). "Section 5.4". The Professional Divers's Handbook (second ed.). 5 Nepean Close, Alverstoke, GOSPORT, Hampshire PO12 2BH: Submex Ltd. p. 242. ISBN 978-0950824260.